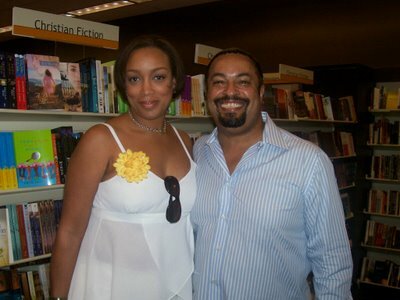 Yesterday, I attended a book signing for author E. Lynn Harris at Books-A-Million for his new novel "I Say A Little Prayer". As you see, my white flowy top made it's debut. For all of you that are familiar with his books, he talked about his new novel that he's working on which is about a 21 year old, straight college football player (can't remember his name), who falls for a young lady named Barrett who makes Yancey (from previous novels) look like Mother Theresa! He hinted that Basil may make an appearance. Can't wait to read that one! Since I was in a bookstore, had to check out the craft periodicals. I picked up the new issue of Knitscene. I like the Camisa top. It looks like it would be a very flattering top. It has an interesting design. You start off by knitting the basketweave panels first, then picking up stitches and working in stockinette downward and picking up stitches on the top and working upward. That seems like enough to keep me busy and from becoming lost and bored in never-ending stockinette. The Central Park Hoodie is cute... classic cabled design. Can you ever have enough hoodies in the Fall? There was one design that intrigued me and bothered me at the same time. It's the Matador. It looks a lot like the Anthropologie inspired capelet on Craftster... I made that one too. Could it be an actual knitted WIP? Speaking of knitting... Do not adjust your monitors! You are not hallucinating, it is an actual work-in-progress. I casted-on lastnight for the SKC KAL for Tempting II. 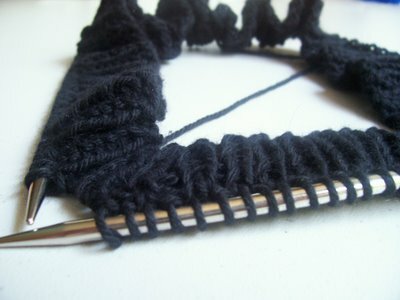 The KAL doesn't actually begin until July 1st, but the way I've been knitting lately, I'll need all the time I can get!